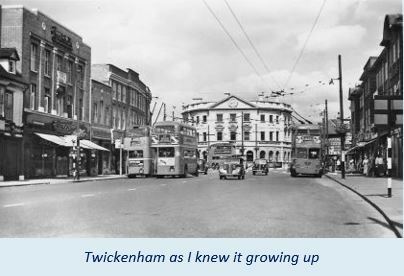 I was born in Twickenham, a suburb of London, in the county of Middlesex, England, in 1943. 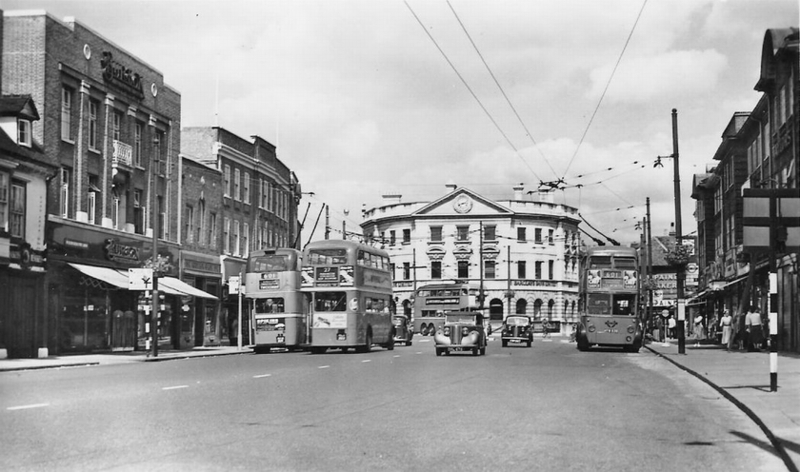 I attended Twickenham Grammar School until entering the job market in 1960, when I started work at Pinewood Film Studios as a trainee sound technician in a golden age of British film-making when the first stereo soundtracks were being created for such epics as El Cid and The Fall of the Roman Empire. This was also the time during which the first five James Bond films were made ~ Dr No, From Russia with Love, Goldfinger, Thunderball and You Only Live Twice ~ on which I had varying degrees of involvement from transferring the rushes [see the Photos page] to working in the post-sync theatre. I then became a dubbing mixer, working on many films, including Bryan Forbes’ Séance on a Wet Afternoon, Deadfall, The Whisperers and The Wrong Box, Stanley Donen's Arabesque and with Ken Russell on Billion Dollar Brain, as well as many others, including several of the Carry On films. After almost seven years at Pinewood, I moved to Twickenham Film Studios for a further two years, working with legendary sound mixer, Gerry Humphreys, on Richard Attenborough’s directorial debut, Oh, What a Lovely War, Ken Loach’s Kes, Peter Collinson’s The Italian Job, Anthony Harvey’s The Lion in Winter, Sidney Lumet’s The Appointment, Richard Lester’s The Bed Sitting Room and many others. In 1970 I left the film industry and went to Cornwall to write my first novel. I have been writing short stories since the age of 20 ~ many of which I’ve destroyed or discarded, along with the novel written in 1970 and a further novella from 1974. My short stories ~ the form I prefer ~ have mostly been inspired by an interest in ghosts and psychic phenomena, which began in childhood, living in a house where a number of ghostly and unexplained incidents occurred. I think I’ve probably had more than my fair share of such experiences, which I’ve chronicled in the second part of my book Strange Tales in Fiction and Fact. 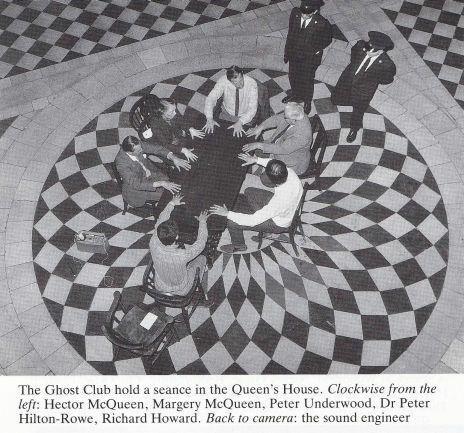 I joined the prestigious Ghost Club in the nineteen-sixties, when the President was Peter Underwood and where, among others, I was privileged to meet Dennis Wheatley, Robert Aickman and Dennis Bardens. 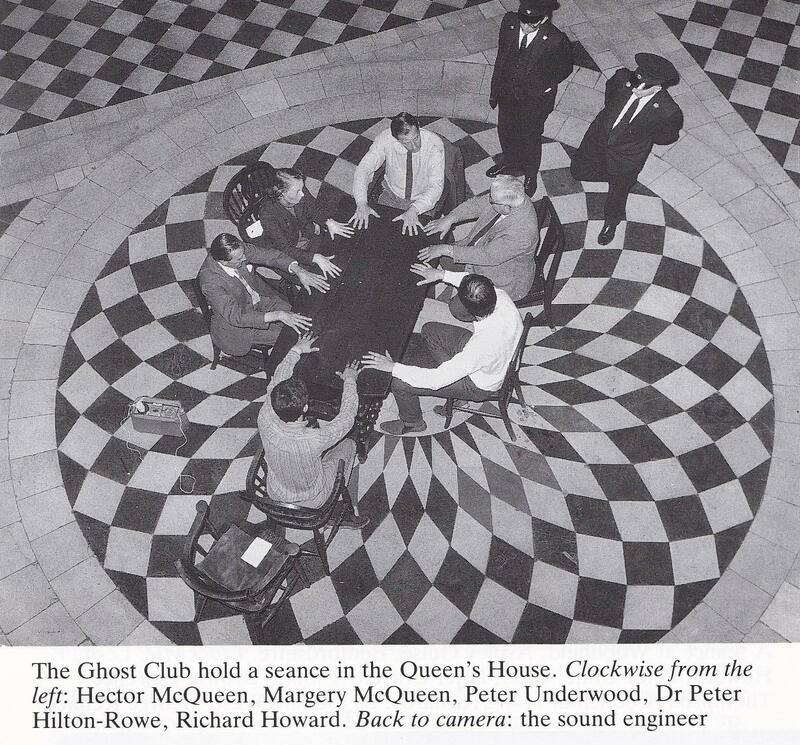 I was also invited to take part in several nocturnal investigations of haunted houses, the most celebrated of which was at The Queen’s House at the Maritime Museum in Greenwich in 1967. The first part of my book, Strange Tales in Fiction and Fact, comprises a collection of twelve short stories written between the years 1974 and 1985 and revised for publication in 2006. Ten years later, I am publishing my second book of short stories, entitled Tales of the Lost, the longest of which, Flora’s Return, was inspired by Jack Clayton’s 1961 film, The Innocents, based on Henry James’ novella, The Turn of the Screw, which I regard as the finest ghost story ever written. Growing up, I read many fictional ghost stories and many others that claimed to be factual. My bookshelves comprised almost exclusively such titles as Stranger than Science by Frank Edwards, Ghosts and Hauntings by Dennis Bardens, The Stately Ghosts of England by Diana Norman, Lord Halifax’s Ghost Book, many volumes of the Pan Book of Horror Stories, and one entitled Alfred Hitchcock Presents ~ Stories they wouldn’t let me do on TV, which contained an especially memorable tale by William Sansom, called A Woman Seldom Found. In addition to these were several volumes of stories by a number of well-known individual writers (see Writing page of this website). All these books sat alongside the author who had first introduced me to the idea of being able to enter other worlds, Lewis Carroll, in Alice in Wonderland and Through the Looking-Glass, both of which I read several times. In parallel with all the above, I developed an abiding interest in symphonic music at the age of 11, when by chance, I heard a performance of Debussy’s La Mer on the radio. 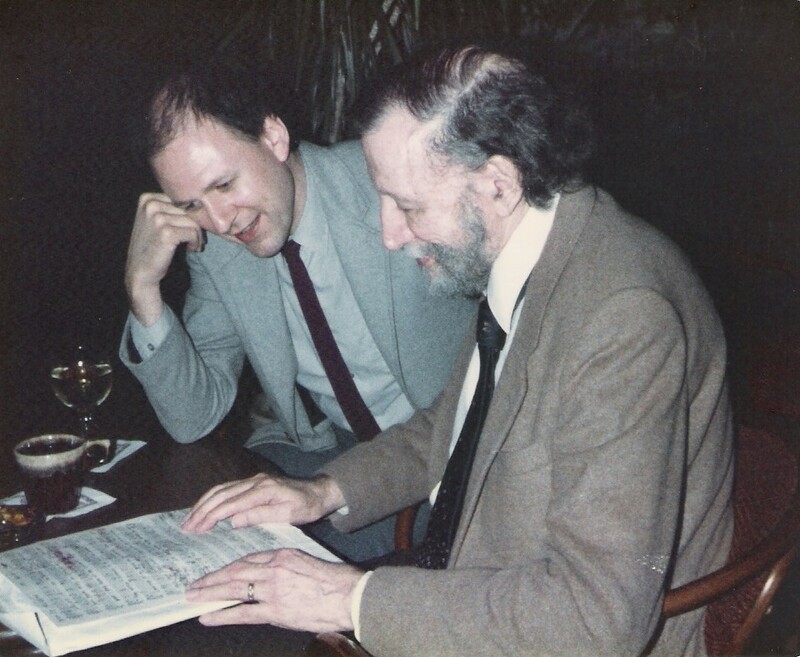 That day marked the beginning of a lifetime’s exploration of symphonic music, which years later led to my befriending the prolific American composer, Alan Hovhaness, whose many works I had decided to catalogue. With the composer’s co-operation, a list of his works up to opus 360 was published in 1982 but was soon out of date as Hovhaness went on to compose a further 84 works, the last of which is opus 434. In 1983, I visited Hovhaness in Seattle for two weeks, when I took the opportunity to record a 70 minute interview with the composer. 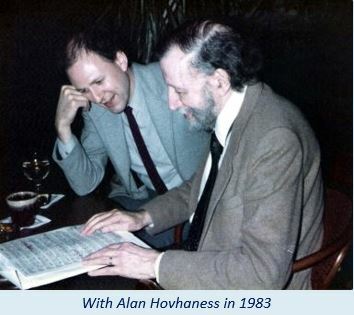 The full text of this interview can be found on the official Alan Hovhaness website at www.hovhaness.com where there is also a link to a now completed catalogue of the composer’s works, updated by Marco Shirodkar. Symphonic music has been a significant source of inspiration for my writing over the years, beginning with my teenage enthusiasm for the music of Dmitri Shostakovich, Gustav Mahler and Ralph Vaughan Williams, via Alan Hovhaness and Andrzej Panufnik (who I was also privileged to know) to Valentin Silvestrov, Avet Terterian, Kalevi Aho, the English composers, Arnold Bax, Edmund Rubbra and Malcolm Arnold, and far too many others to mention. After leaving the film industry, I had a series of jobs that gave me maximum free time in which to write. These included part-time as a sub-editor on a local newspaper for which I also wrote film reviews, and later working as an assistant in The Arts Council Bookshop in Long Acre, Covent Garden, where a regular customer was Ted Perry, founder of the very successful independent classical record label, Hyperion Records. Ted often came to the shop in search of an appropriate picture for one of his CD covers and, because of my great interest in art, I was often able to help. As a result, when The Arts Council closed its shop, Ted offered me a job as product manager and picture researcher at Hyperion, where I stayed until I retired in 2008. In 1992, I took part in The Mastery, a three-day intensive workshop held at The Actors’ Institute [sadly no more] in Islington, and followed this with regular acting sessions and intensive workshops at the same venue and later with Tom Radcliffe, who had studied with Sanford Meisner in New York and whose methods Tom brought to London and taught in his London Group Theatre. This led to Tom casting me in the role of Nicholas, in Harold Pinter’s play, One for the Road. These acting experiences over a period of two or three years were life-enhancing and allowed me to fulfil a long-held ambition, after which I returned to writing. Later, I completed a three year diploma course in counselling and did further training in hypnotherapy, which was of great interest to me. In recent years, I have been invited to give music presentations to various recorded music societies, which operate under the umbrella of the national Federation of Recorded Music Societies. With an abiding interest in mainly 20th century symphonic music, this has given me the opportunity to promote the works of many neglected composers who I strongly feel should be better known. A list of programmes on offer can be found in the Music section of this website. Aside from music and fine art, I have a passion for broadleaf trees and love the English countryside, which has also been a source of inspiration for some of my stories.